Do you have a tattoo? I don’t. But I love to see them on others. Among the overplayed lotuses, butterflies, and infinity signs are gorgeous works: angelfish swishing chiffon-like tails; maps of fictional places; gardens that couldn’t exist in real life. Last summer, I spent an afternoon at the Musée Quai Branly’s tattoo exhibit and was mesmerized by photographs and drawings of centuries of body art adorning everyone from prisoners and fire eaters to sailors and tribal leaders. So, despite my tattoo-less skin, I thought I’d give the three Gri Gri for Tattooed Skin fragrances — Tara Mantra, Moko Maori, and Ukiyo-E — a go. Gri gri (or gris gris) is a form of talismanic magic consisting of a small, handmade pouches with something significant in them to protect their wearers or bring luck. Anaïs Biguine of Jardins d’Ecrivains is the creative director for Gri Gri. According to Olfactif, Biguine plays with raw materials to sketch an idea for a scent, then sends it to perfumers in Grasse to finetune. The final products emerge after a number of back and forths. With Gri Gri, I expected a Parisian take on history and primitive art, with a dash of bohemian allure — in other words, the perfect candidate for a shelf at Barney’s. My expectations were met. Tara Mantra (saffron, cardamom, hing,1 patchouli, ajowan, lotus, jasmine, agarwood) was inspired by Indian tattoos. The Jardins d’Ecrivains website (the Gri Gri Parfums website isn’t fully up yet) says of Tara Mantra, “This fragrance evokes all the best that humanity has to offer.” I’m not ready to go that far, but I do like the fragrance. Tara Mantra’s notes led me to expect a whopper of a scent, but, like the other two, it’s surprisingly sheer. Tara Mantra’s agarwood blends with the saffron for a faint iodine tang, and the patchouli is subtle enough not to stand out. It smells of gentle herbal spice balanced with wet wood, like opening a damp antique wardrobe where dried roses, saffron, and cardamom were stored long ago. Moko Maori (tussock grass, New Zealand flax, fern, kowhai, manuka, lichen, kanuka) “evokes victorious nobility,” according to its description. If so, then victorious nobility smells like dried grass and rose petals, and it shimmers with something salty up top. Ritual Maori tattoos inspired this one. As Moko Maori dries down, my skin smells as if it were rubbed with herbs and grasses, then washed with a musky soap. The fragrance is faint and clean, but intriguing and strangely old fashioned. That’s to say, it doesn’t smell like a vintage fragrance, but it smells like an old bottle that once held some sort of “patent cure” but is now empty. Ukiyo-E (genmaicha, yuzu, aralia, daphne, green tea, sakura, ashibi) “makes time stand still with its aromatic and aquatic notes.” (Honestly, where do people come up with these things?) Once time gets moving again for the people who smell it, they’ll notice a prominent note of toasted rice. Ukiyo-E is the one Gri Gri with definite development, and thanks to genmaicha’s bready fragrance, it has the most assertive character of the three. And, yes, Japanese tattoos inspired this one. After about fifteen minutes, Ukiyo-E’s toasted grain retreats into the composition, and a thin, white-green floral note infuses it. The fragrance sweetens and gentles a bit and becomes more sheer over time. I know that "aquatic" can strike terror into a perfumista's heart. Rest assured, there's no melon and cucumber here. To me, the Gri Gri fragrances feel like upscale, interesting body sprays. They’re unusual enough that they transcend traditional gender slots, yet although I can’t think of other fragrances quite like them, I wouldn’t call them freaky. I easily imagine a couple keeping a bottle on their dresser for either partner to grab and spritz as they dress or when they change clothes. Also, these fragrances have good longevity — about five hours on my skin — but they wear more like a sheer veil of scent than a perfume. They're skin scents, I guess. But, unlike tattoos, they’re gone the next day. 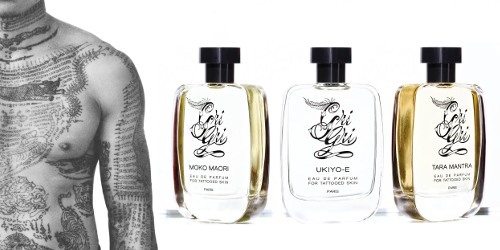 Gri Gri Eau de Parfum for Tattooed Skin Tara Mantra, Moko Maori, and Ukiyo-E are $110 for 100 ml at Twisted Lily in the US or Selfridges in the UK. 1. These fragrances’ notes are full of trees, shrubs, and seeds native to the countries whose tattoo cultures Gri Gri portrays. Sometimes the names are simply a fancy way of saying something common (e.g. “sakura” for “cherry blossom”). Rather than describe each one, I’ll let you look them up, if you’re interested. How perfect for summer. While the first one doesn’t sound like my cup of tea, the other two intrigue me and I’d definitely give them a sniff. Though I do prefer my perfumes to have more than just a hint of presence so that could be a problem. And so far, I have two tattoos. An overly played lotus and ankh down my spine/back and a chain of tiger lilies around my ankle. The tiger lilies sound gorgeous! I think these are good for summer, too. They’re easy to wear, but interesting–the sort of thing you could spritz on without thinking, and still smell smart. “Gri Gri” (spelled grigri or gris gris) means an evil hex or spell in Malagasy culture. It can also be translated as “the evil eye.” In any case, this is NOT a positive association for a product I’d put on my skin! It sounds like asking for trouble, to me. Interesting! If it helps, there’s nothing wicked smelling about it. Moko Maori describes my daily walk through tussock, harakeke (NZ flax), manuka, kanuka, fern and kowhai and the scent is incredibly rich and varied depending on the heat of the day, time of year etc….but although I have tried over the past five years to put a name to the notes I have never detected so much as a hint of rose or musk…which makes me doubly curious about Moko Maori. In nature I get leather, peanut skins, hay, menthol, fern….so I really want to try this one. Thanks for describing it! I like your description of the real NZ environment–it sounds dry and earthy with a hit of menthol. So nice! I have smelled these – Tara Mantra was very skanky/animalic on me for at least the first hour or two, then it dried down to something more pleasant. Moko Maori smelled like dusty herbs, not something I enjoy. I liked Ukiyo-e the best, it reminded me a bit of Bois Fariné with the toasted rice/bready note. None were appealing enough to me to buy sadly – I really wanted Tara Mantra for the name, but it was just not wearable for me. I think Tara Mantra was the one I liked most! I thought of Bois Fariné, too, when I smelled Moko Maori. They grew on me the more I wore them. Thanks for reviewing these interesting sounding fragrances, Angela! I’d have thought that Hermes would have had Ukiyo-e copyrighted, even though the spell it differently in Iris Ukiyoé. The first thing I thought of was the Hermes scent! And these fragrances are worlds apart.